A fun and engaging App that helps parents support their children through the challenges of family separation and divorce. Join thousands of families, schools and professionals worldwide who trust and use our App to express their feelings about divorce and family breakup. 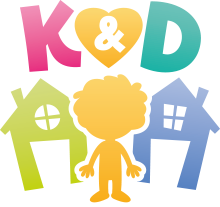 Designed for the child (4-11 yrs) and parent to use together, K&D’S Creative story making language has great potential for a child, to grow their emotional intelligence, wellbeing and social health in a safe environment.